When her husband Dustin is diagnosed with a terminal illness, Dr. Katherine Talton throws herself into exploring the boundaries of robotics and artificial intelligence to try to find a way to save his life. With the end drawing near for Dustin, Katherine pushes further into untested technological realms, refusing to let go of the man she's spent her life with. 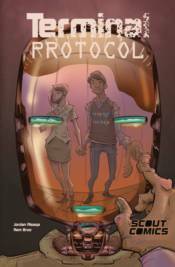 Terminal Protocol explores how far one woman is willing to push the boundaries of science to save the man she loves.